Overview: the story of RMS Titanic begins at a London dinner party in 1907 attended by White Star Line Chairman, J. Bruce Ismay and Lord Pirrie, a partner at shipbuilder Harland and Wolff. Following a discussion of how they might work together to respond to the increasing competition on the North Atlantic sea route, Ismay and Lord Pirrie agreed that Harland and Wolff would build three super liners, Olympic, Titanic and Gigantic (her name was later changed to Britannic). These three sisters would provide unmatched luxury and safety for transatlantic passengers. While the ships would be fast, they were never intended to challenge for the record Atlantic crossing. At over 45,000 tons, they would be the largest passenger liners ever built. Titanic would be over 883 feet long and could carry over 2,600 passengers. Construction on the first of the three sisters, Olympic, began in late 1908. Work on her sister, Titanic began a year later in March of 1909. Because the ships size, both the facilities in Belfast, where the ships were built and New York, their North American destination, had to be expanded. Titanic was launched in May of 1911 and spent the next 11 months fitting out at the Harland and Wolf shipyards. A total of three million rivets were used on her hull, and each of her anchors weighed approximately 8 tons. 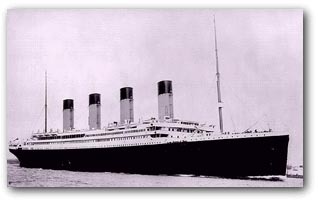 Titanic's maiden voyage was originally scheduled for March 20, 1912, but in February of that year, her sister Olympic lost a propeller blade and had to return to the shipyard for emergency repair. As a consequence, resources were temporarily pulled from the Titanic project, and the ship's maiden voyage was delayed until April 10, 1912. Titanic did not sail at full capacity on her maiden voyage. A total of 337 passengers sailed in first class, 271 in second class and 712 in third class, or steerage. Most third class passengers were emigrants from Ireland, England, France, Poland, Scandinavia, Italy and the Middle and Far East. While many writers (and web sites) claim that the builders dubbed her "unsinkable", there is no record that White Star or her captain Edward J. Smith ever using those words to describe Titanic. It is more likely that this unfortunate, and inaccurate, label was applied by the popular press at the time and over the years it became attributed to both the captain and White Star. The reality was that Titanic offered her passengers the latest in shipbuilding technology with a double hull and a total of 16 water-tight compartments that were designed to keep her afloat even if up to 4 of them became flooded. While she carried more than the required number of lifeboats for the time, the regulations in effect in 1912 had not been updated to deal with ships of Titanic's size and as a result, her 20 lifeboats only had space for approximately 1,200 of the 2,600 passengers she was expected to carry. In addition to the latest technology, she also provided her passengers some of the most luxurious services and accommodations available. To keep passengers occupied during the crossings she had an indoor swimming pool, a squash court, a gymnasium and even a Turkish Bath. To help passengers stay in contact with business or friends at home, she was equipped with a Marconi radio transmitter and receiver which was staffed 24 hours a day. The facilities in the first class staterooms were unmatched at sea and even rivaled many of the finest shoreside accommodations. The quality and variety of food on board was exquisite and the level of service was superb. In addition to the formal dining room, Titanic also offered her first class passengers more personal service in the Verandah restaurant where they could order from a special a-la-carte menu. Much like transatlantic crossings today, during days at sea Titanic passengers could enjoy music, stroll along an enclosed promenade, or relax in a deck chair with a book selected from an extensive ship's library. Accommodations for second class and steerage passengers, while nowhere near the luxury of first class, were nonetheless superior to many of the top accommodations found on other ships. This new level of luxury and service attracted the elite of British and American society and as a result, Titanic sailed on her maiden voyage with a passenger list that included an unmatched list of celebrities. She also attracted a large number of steerage passengers who were drawn by her size and reputation as a safe ship. While Titanic sported 4 funnels, only three of them were functional - the fourth funnel was added for cosmetic and marketing purposes. She left Southampton at noon on Wednesday April 10th and proceeded across the English channel to Cherbourg, France where she stopped briefly to pick up additional passengers. Her departure from Southampton was not without incident as Titanic nearly collided with a steamer after the suction of her four propellers snapped the steamer New York's lines and drew her toward Titanic. Captain Smith avoided the collision by cutting Titanic's engines and using the port propeller's wash to keep the ships apart. In Cherbourg, events went more smoothly and after picking up passengers from tenders, Titanic proceeded northwest to Queenstown, Ireland to pick up her final group of New York-bound passengers. She also dropped off a few very lucky Queenstown-bound passengers. On the evening of April 11th, she left Queenstown and headed out into the Atlantic. As she headed east, she took the southern track which followed the arc of a great circle from Fastnet rock to the Nantucket Shoals Lightship. This was considered the safest route to avoid the dangers of thick pack ice and large icebergs typically found in more northerly waters at that time of year. As Captain Smith gradually increased her speed to 22 knots, the experienced passengers on board began to settle into the normal routines of a crossing - getting to know their fellow passengers, exploring the ship, and dressing for diner. Weather was clear and relatively warm, since the winter of 1912 had been uncharacteristically mild. Unfortunately for Titanic, this mild winter had caused an unusually large amount of ice to break away and drift south into the shipping lanes. With nice weather and smooth seas, passengers in all classes enjoyed four pleasant days at sea. On Sunday, April 14th, the weather began to change and the temperature began to fall. Titanic received at lest five different warnings of ice ahead, but since they had not spotted any ice yet, Captain Smith saw little reason to reduce Titanic's speed. Later that evening, the wireless operator received a sixth ice warning, but since he was an employee of Marconi - not White Star - and his primary job was to send passenger's messages to shore rather than relay messages to the bridge, this final warning was put aside until thing settled down in the wireless room. Outside the temperature continued to drop but the moonless, star-filled sky remained clear. At 11:40, lookout Fredrick Fleet spotted an iceberg dead ahead. He rang the bridge and First Officer Murdoch responded by ordering Titanic turned hard to port and the engines full astern. As a result, Titanic began a slow turn away from the iceberg. Unfortunately, she was too close and moving too fast, and her starboard side brushed against the berg. Surprisingly the impact against the iceberg was barely felt by most passengers with many sleeping through the entire incident. A number of the passengers awake at the time thought Titanic had just barely touched the iceberg or missed it completely. Very few believed the ship had been seriously damaged and some even played football with pieces of ice that had fallen from the berg to the ships foredeck. Contrary to most reports at the time (and for the next 72 years), Titanic did not suffer a "huge gash" but rather an extended separation of her hull plates. The result was a very small, but very long opening to the sea that doomed the ship. Soon after the collision, Captain Smith summoned the Titanic's builder, Thomas Andrews to accompany him on a tour of the damage. After visiting the forward section of the ship, Andrews informed Captain Smith that the damage was fatal and that the ship would probably sink within two hours. Ironically, had the lookouts not seen the iceberg and Titanic rammed the berg head-on, the damage would have been limited to her bow compartments and she likely would have made it safely to land. Just after midnight the crew was instructed to begin waking passengers and advised them to dress warmly, put on their life jackets and report to their lifeboat stations. Since the lifeboats could only accommodate about 1,100 passengers, it was decided that women and children would be put into the boats first. Unfortunately, due to a variety of reasons including, language, location and social class, passengers in second class and steerage did not arrive at their boat stations until much later, after many of the lifeboats had already left. As a consequence, a greater percentage of these passengers perished. All of the boats were launched by 2:00 am. and the remaining passengers began moving toward the gradually rising stern. As the bow dropped deeper into the cold water the ship's band continued to play a variety of popular music - although contrary to popular perception it is unlikely they ever played the hymn "Nearer my God to thee"
By 2:10 am, the angle of the deck was so steep that the band could no longer stand to play and they probably joined the growing crowd struggling to climb up the deck. Finally, at 2:15 the weight of the bow section became so heavy that the hull actually fractured and the stern section of the ship separated. As the water-filled bow plunged toward the bottom, the mostly empty stern, righted itself temporarily and then quickly filled with water and joined the bow on a two and a half mile plunge to the cold Atlantic floor. Of the 2,400 passengers that left for New York on Titanic, only 705 had made it into lifeboats. The remaining 1,502 passengers perished - with many left struggling in the near freezing water. Just before 4:00 am on the morning of April 15th, the survivors saw a faint light on the horizon. Soon thereafter, they saw rockets in the sky fired by the Cunard liner Carpathia. She was the first of the rescue vessels to reach Titanic's last reported position and she had raced heroically through the night dodging icebergs and the surrounding ice fields in a desperate attempt to reach the stricken liner. Carpathia began picking up survivors as dawn broke and by mid morning it was over. By 8:30 am all of the surviving passengers and the Titanic's lifeboats, all that remained of the largest ship afloat, were aboard and she headed for New York. She arrived there on the evening April 18th and was mobbed by hopeful families and a waiting press. Today Titanic rests on the bottom of the North Atlantic 2 1/2 miles down at approximately - latitude 41o 46'N, longitude 50o 14'W. The wreck was located 73 years after she went down, by Dr. Robert Ballard of Woods Hole Oceanographic Institution. It was Dr. Ballard who was able to confirm the previous reports that the ship had broken in two before she sank.